A Varla Stone (Aldmeris for "star stone") is an enchanted shard of cut Meteoric Glass, a rare type of Aetherial Fragment. The stones were created by the Ayleids. The luminescent white crystals are remarkably powerful, enabling untrained users to restore magical energy to any number of enchanted items. 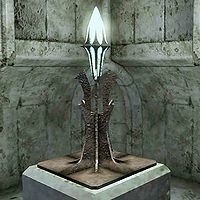 Because of their great value and utility, many of these artifacts were looted from Ayleid ruins after the disappearance of their creators. As such, intact Varla Stones are also extremely rare, but since they are small and easily concealed, diligent explorers may still occasionally come across them. When used, a Varla Stone will crumble to dust; there is no known way of recharging or preserving the stone, although scholars believe that their magical power may have originally been maintained by the Great Welkynd Stone of an Ayleid city. Varla Stones are usually found atop pedestals in Ayleid ruins, sometimes protected behind a remotely-opened cage. Flawed Varla Stones can also be used to recharge an enchantment, although to a much lesser extent, roughly equivalent to that of a common soul gem. Similar crystals include Welkynd Stones, Culanda Stones, Malondo Stones, Vakka Stones, Stormhold Crystal and Star Teeth.